I start clipping toenails when kittens are about three weeks old and starting to scuttle around. Those baby needle sharp claws are fierce, and they don't yet have the ability to sheath them! Once cats are a year or two old, clipping is necessary only about once a month, but while they are growing you may need to clip them weekly to keep the edges dull. Particularly when they are kneading or playing they may find it hard to keep those claws in, so for everyone's comfort, keep them clipped. This is much easier to do than many people imagine, and considering my kittens are used to the process, they generally don't put up much of a fight. I use regular human toe-nail clippers, but some people prefer the scissor style or guillotine style clippers you can buy in any pet-food store. Hold the cat firmly but gently; some are comfortable on their back lying in your lap, others may be easier to control on a table or countertop where you can lift one foot at a time. For a particularly recalcitrant kitty, you can wrap them in a towel or blanket and uncover one foot at a time (try less restraint first, as this method will really annoy your cat!) It may be easier to have a second person to scruff the cat, but I've never found a cat I couldn't control with one of these three methods. Holding the paw in your passive hand (leaving the dominant hand holding the clippers) you gently press on a toe until the claw is extended enough for clear visibility. For long haired cats you can also dampen the fur around the toes and push it back somewhat to better see the claw. Clip only the tips. Unless claws are particularly dirty or thickly overgrown, you can easily see where the pink starts - avoid cutting anywhere near there! With an older cat not used to having it's nails clipped it may not be so simple, but for kittens, just hold them and talk soothingly while you gently extend the nail with your dormant hand. Using your prominent hand, position the clipper over the tip of the nail and snip. Don't make this a big deal and the kitten won't either! If they struggle or squirm, continue to talk sweet and try to get at least a few nails done in one session. Take a minute to give them a treat, a nice neck scritch, or to play with them while they're still on your lap after the clipping and they will associate the process with pleasure. You want to look at the nail carefully while clipping so as not to cut into the "quick". 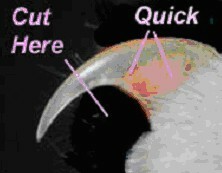 Cats have translucent claws and it is easy to see where the pink starts, which is the part you want to avoid! If you nip this part and it starts to bleed, don't be too concerned and be sure to follow up this torture session with a treat! If you do cut down too far you also want to have another clipping session fairly soon after, so the cat doesn't associate the process with this painful memory. The bleeding should slow or stop within minutes. If it continues to bleed or bleeds profusely you can use some styptic or plain white flour to staunch the injury. While it is extremely rare, if the claw continues to bleed or bleeds profusely after 20-30 minutes, call your vet.